1 Combine crabmeat, Hellmann's® or Best Foods® Real Mayonnaise, parsley, egg, Worcestershire sauce, horseradish, mustard, Old Bay Seasoning, salt and hot pepper sauce in medium bowl. 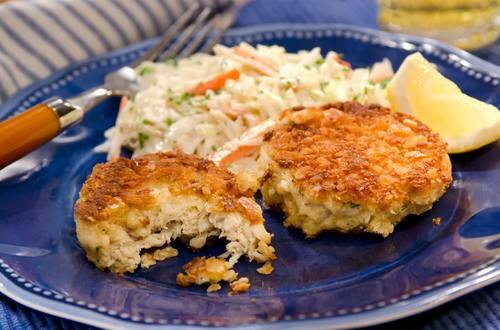 2 Shape into patties using 1/3-cup crab mixture for each, then roll in cracker crumbs. 3 Heat I Can't Believe It's Not Butter!® in large skillet over medium heat and cook crab cakes until golden brown and crisp, turning once. 4 Serve, if desired, with coleslaw.